Much of our world communicates by text nowadays, as opposed to voice or face-to-face. Texting, instant messaging, tweeting, status updates–that is how we keep in touch with each other. The basic QWERTY keyboard and number pad is usually sufficient for our everyday needs, but every now and then, we want to input a little extra. 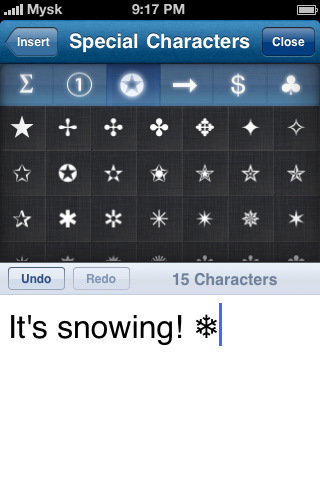 With Mysk’s TextCrafter app for your iPhone, a text editing application, this would be a very simple undertaking. TextCrafter launches into a screen for you to type in, familiarly bisected into a blank page and a keyboard. You can use this app to create emails, texts, Facebook status updates, and tweets for Twitter (make sure to log in under your Settings in order to update Facebook and Twitter); there is a counter at the very top to help you keep track of the number of characters. Once you’re ready to send out your message, tap the button on the top right–cleverly designed to look like the Apple Command key–to open up your text in a whole new Crafts page, which comes with options such as Edit, Insert, and Share. Edit allows you to change text cases and shorten URL links, which is especially helpful for Twitter (switch between services under Settings). The Insert option includes Contact Information (pulled from your address book), Location (pulled from GPS coordinates, street addresses, or even a map link to your location), and my personal favorite: Special Characters. All those fancy-schmancy Webdings and Wingdings you’ve always had to pull up a Character Map to copy from? Are now right there at your fingertips. A person (me) could go crazy adding cute glyphs to even the most inane statements. For any changes made while in Crafts can be undone or redone using the handy buttons above the text. After you’re done composing the message, you can send it out into the world using Share. I love that the TextCrafter app brings so much to the text table, but I wish it were easier to export your “crafted” text to places other than email or Twitter; there should be a Copy All function somewhere, so I can paste it onto a hypothetical journal entry or some such. Be aware that some devices or machines will not recognize special characters; I checked a tweet chock-full of them on someone’s Blackberry, and none of them showed up. Insert sadface. 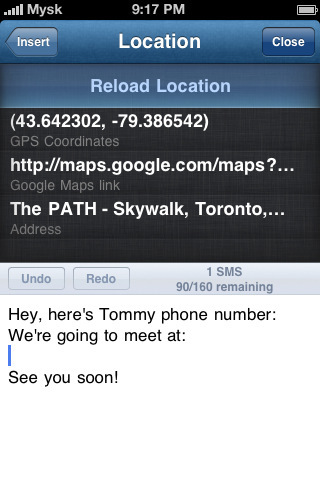 Also, your own device needs to be GPS-enabled before TextCrafter will allow you to insert GPS coordinates. As it is, I’m keeping this app around purely for its Special Characters option, which I adore and fully admit to abusing all over the Internet. It’s not confusing to use at all, but $1.99 is a tad steep, so I’d like more functionality before shelling out. AppSafari review of TextCrafter ~ Craft & Share Text was written by Julie Guan on March 19th, 2011 and categorized under App Store, Chat, Email, Productivity, Utilities. Page viewed 4930 times, 3 so far today. Need help on using these apps? Please read the Help Page.